Old and New | Eating well, with creative recipes, to follow the Fasting Lifestyle according to Michael Mosley's "Fast Diet." 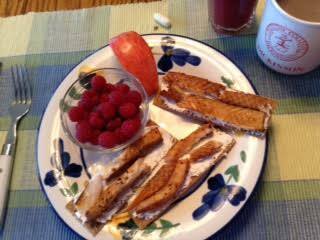 Here’s a new breakfast for you and a twist on a dinner classic. With the last blog post in mind, check the nutritional values of these meals, separately and together. Nordic Breakfast 297 calories 11.7 g. fat 15.5 g. protein 34.8 g carbs PB This is based on a recipe from the Fast Diet book, but I always thought it looked like a puny anount of food. After a few tweeks, this will fill you up! Carefully spread the cream cheese on the crackers. Divide the salmon among them. Arrange the onion rings atop the salmon. Slice the apple and pour your hot beverage. Skip the aquavit. Quiche: 291 calories 17.7 g. fat 24.7 g. protein 11.8 g. carb GF PB I suggest serving this meal on a day when you have eaten one egg or none for breakfast. Eggs are good for us, but you don’t want to over-d0 it with any ingredient. If not using left-over vegetables, steam the vegetables to cook until tender. Set the oven at 400. Lightly oil 3 wells of a standard muffin pan. Put water [1/2”] in the ungreased, empty wells. Or use a mini-muffin pan and plan to use about 6 of the wells. Grate the cheese and toss lightly to combine. Beat the eggs and milk together and add the seasonings. Feel free to use lots of basil and thyme! Spoon equal portions of the vegetables into the prepared pans. Then top with cheese mixture. Pour the egg mixture over the veg and cheese. Bake until puffed and golden brown and a thin knife stuck in the center comes out clean and dry. Let the quiches cool while you slice the tomatoes. 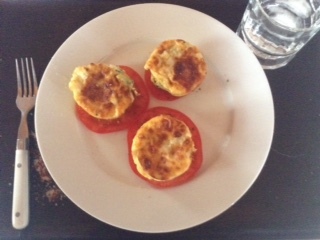 Serve each quiche on a tomato slice or next to them.